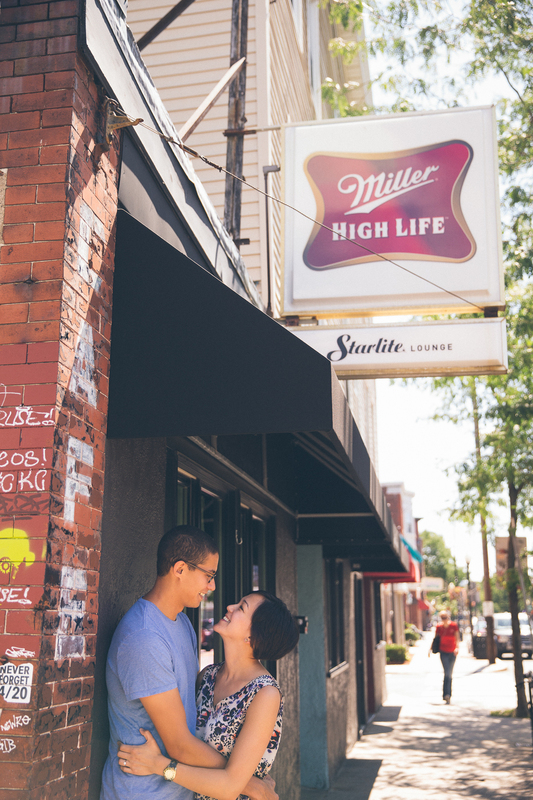 Laura and Dan will tie the knot at the Cambridge Multicultural Arts Center next June, and in preparation for their wedding day, photographer Jason Kan took our beautiful couple out and about in East Cambridge to help ease them into the idea of being in front of the camera. But to be perfectly honest, they were naturals! Jason knew all of the best Cambridge backdrops to pick up on the fun, vibrant setting that perfectly reflects this couple's bubbly nature. And of course, they had to visit some of Laura and Dan's favorite Cambridge haunts, like Parlor Sports and Punjabi Dhaba, the settings for some of their most fun dates. It's always a good idea to take advantage of an engagement session, as these private sessions with your photographer serve several purposes. Namely, this will help you both get used to being in front of the camera. This also gives you some extra time to get to know your photographer to better understand how they work behind the camera. You'll be spending the largest portion of your wedding day with said photographer - it makes for a more fun and relaxing day if they feel more like an old friend to you, than a person you've never met before. Lastly, the result of an engagement shoot is a number of beautiful photos! You can see how you both look on film and ideally, you have great photos to choose from for a guest book, save the dates or thank you cards later. Thanks again to Jason and Emily Kan for taking such great care of our fun and fantastic couple!